Little Lou’s was established on August 27, 1997 by the Thuerrauch family. It was originally bought to sell crabs, fish, ect, which were caught from our own boats. The Thuerrauch’s have been fishing the Upper Chesapeake out of Middle River, Maryland for over 60 years. Captain Ray Louis Thuerrauch, aka “Radar Ray”, father of Louis Thuerrauch, grandson of Little Lou Thuerrauch Jr. had perfected the art of fishing and crabbing as we know it today. The experience of being a local waterman has enabled Little Lou to catch the best seafood, and know where and when to find the freshest seafood. 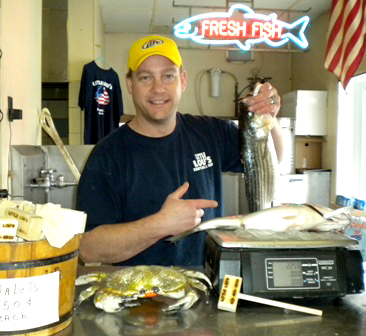 Now, still serving fresh fish and crabs locally caught. We also, have mastered and created our own special crab seasoning, which is the perfect blend for the perfect crab. In addition, all of our food is prepared in store, made fresh daily, with family recipes dating back centuries. Furthermore, our sub rolls are freshly made and baked every morning. Our top sellers include: Jumbo Lump Crab Cakes, “our famous cod fish cakes”, and the “award winning shrimp salad sub.” Also, all of Little Lou’s salads can be bought by the gallon…our shrimp macaroni salad is outstanding. Not to mention, our cheese steaks are to die for, especially on our freshly baked rolls. We now have expanded and can provide catering for any occasion, no job is too big or too small!